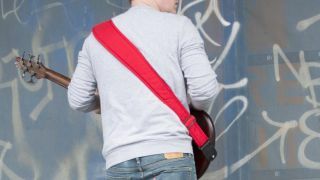 ESO Strap reckons it's made "the perfect bass guitar strap"
Last year, Seattle co ESO made big claims about its "perfect guitar strap" - and now it's brought that ergonomic experience to the low-end. The ESO bass strap features the same contoured 'S' shape to avoid pressure points and stop cutting into bassist's necks, aided by a high-density foam core. Elsewhere, two in-seam pick pockets enable players to replace or store plectrums quickly, while reinforced stitching, hand-crafted Brazilian leather end pieces and smooth-stop adjustors round off the spec. The ESO bass strap is available now in right- and left-handed configurations for $59.99 from ESO Strap.